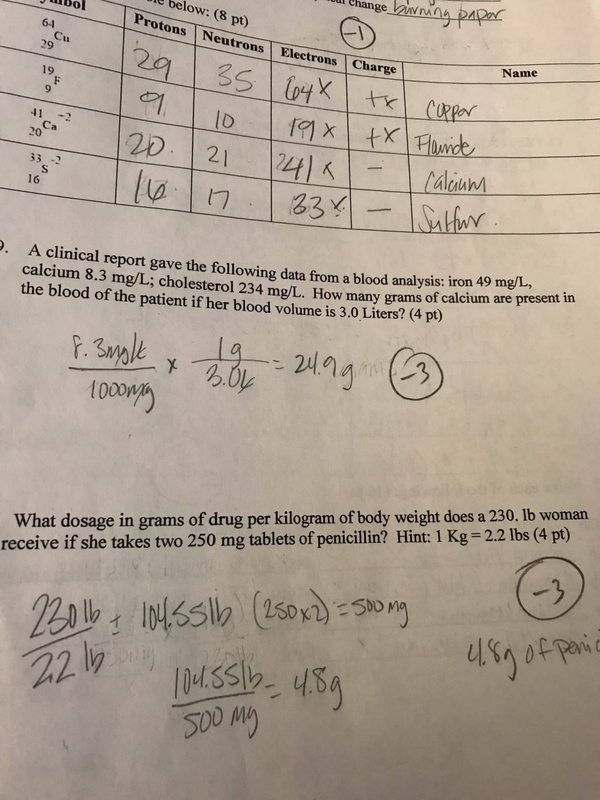 My friend asked for some help with dosage calculation problems, but the format of the last two questions are throwing me off. Could anyone give me a hand setting up these problems please? I see that the second to last problem needs grams of calcium, and they forgot to convert mg to grams. The last one I think it is asking for me to find the gm/kg. Then I am confused as to what is next. Your friend didn't pay attention to their units when doing the problem. For example, they divided 230 lbs by 2.2 lbs and came up with 104.55 lbs. The patient weighed 104.5 kg not 104.5 lbs. Because lbs appears in both the numerator and denominator, you can eliminate lbs in the equations. You are left with kg in the numerator. Now you know that a 104.5 kg patient was given 500 mg of the med. Another way to say that is the dose was 500mg/104.5kg. The question is asking what was the dose in grams/kilogram. I see﻿﻿ that the second to last problem needs grams of calcium, and they forgot to convert mg to grams. When you work this type of problem the first thing you should do is to write what you are given (calcium, 8.3 mg/L) on the far left hand side of your worksheet. Then write what you are asked to solve (g calcium present in the blood) on the far right side of your worksheet. What steps do you think you need to do to solve this? How much calcium is present in the patients 3L on blood. Calcium is measured in the problem in mg, and the answer needs to be in grams. 8.3mg x 3L divided by 1000. 104.5kg and she takes two 250mg tablets a day. 500mg (2 tabs of 250mg) in grams is 0.5 grams. I can't see the rounding instructions, but is that the way to go about that problem? This isn't correct. You're not consistent in your units of measure. ETA: I'm not sure how you're setting these problems up, but if your not using dimensional analysis you really should try and learn it. And don't try and concert units in your head, or make multiple conversions simultaneously; this leads to the possibility of making a 10 fold mistake, which can be fatal depending upon the medication or patient population. tabs and mg cancels out. Reduce 250 to 1, and 1000 to 4.
reduce the left over 2/4 to 2grams. I am left with 2grams and 104.5kg, but I don't understand what to do from this point on. This makes it much easier to follow as you lose alignment when you post in line. I am left with﻿﻿﻿﻿﻿﻿﻿﻿﻿ 2grams and 104.5kg, but I don't understand what to do from this ﻿point on. Once you have the correct dose and patient weight, what do you think you could convert the total dose to g/kg? Use a calculator to divide 0.5g by 104.5. You won't get 4.78. You are off by a factor of 1000. When doing math ask yourself if it makes sense that by dividing 0.5 by 104 that you would get a number BIGGER than you started with. Of course not. If you have 1/2 and divide it by 104, your answer is going to be a lot SMALLER than the 0.5g that you started with.